The Organisation of Pharmaceutical Producers of India (OPPI) represents the research-based pharmaceutical companies in India. 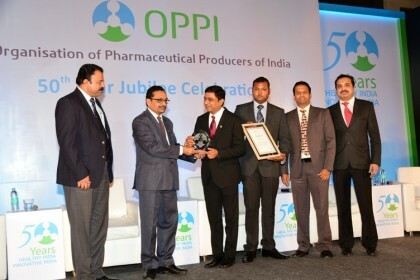 OPPI celebrated its 50th year with all healthcare stakeholders, looking back at a memorable half century and renewing its commitment to bringing quality medicines to patients across the nation. In his inaugural address, Shri. Ch. Vidyasagar Rao, Hon’ble Governor of Maharashtra, said, “I have come here to express my sense of appreciation to the OPPI and to the captains of the pharmaceutical industry for your outstanding contributions to the cause of nation building.” The Governor stressed on India’s tremendous strength in life sciences, specifically in innovative medicines and the country’s rich human capital, including chemists, pharmacists, biologists and engineers. “The research-based pharmaceutical industry in India has long been a partner in India’s economic growth and development, including through technical collaborations, disease awareness programs, patient access initiatives and drug safety efforts. At this juncture, we need to have a renewed thrust on innovation from the pharmaceutical industry in India,” he added. Dignitaries including Dr. V K Subbaraj, Secretary, Department of Pharmaceuticals and Dr Jagdish Prasad, Director General of Health Services were present on the occasion celebrating the ’50 Years theme: Healthy India, Innovative India’. In a recorded message, Shri Devendra Fadnavis, Hon’ble Chief Minister of Maharashtra, commended the good work of the pharma companies, while assuring the industry of a conducive business environment for sustained growth. Ranjit Shahani, Vice Chairman and Managing Director, Novartis: President Emeritus, OPPI. The day saw two animated panel discussions. The first on healthcare innovation in India focused on the sort of innovations that can transform the healthcare landscape in India. The second, patient group discussion, touched upon the important role that pharmaceutical companies must play to improve the lives of patients and support responsible healthcare.